Place the opening of votive down on the newspaper. 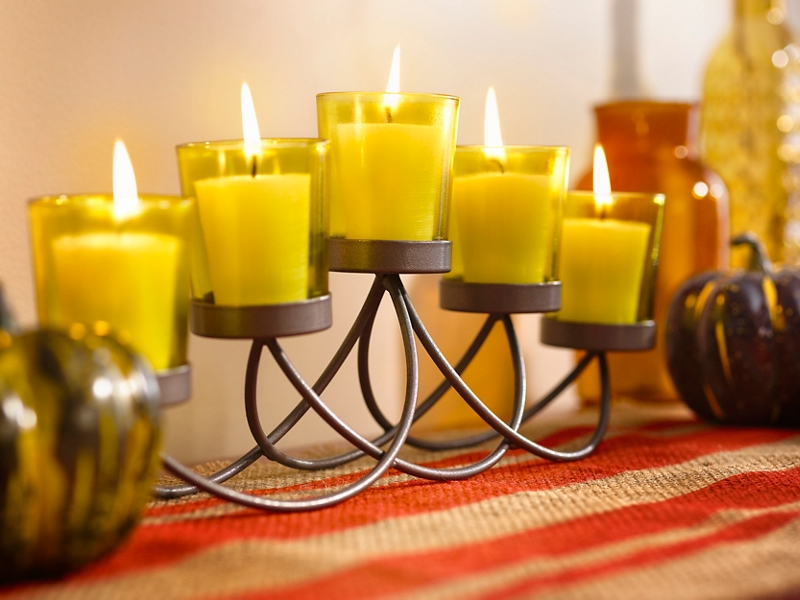 Spray the outside of the votives using Krylon® Stained Glass Paint in Canary Yellow. Spray in sweeping motions side to side with slight overlap for optimal coverage. You may choose to spray fewer coats to add just a touch of color to the glass or multiple coats to create a more vibrant piece. Allow your votives to dry completely before handling. Place centerpiece Tealight holder on newspaper. Paint with Krylon® Fusion All-In-One™ Hammered Finish in Brown Hammered. Allow the candlestick holder to dry prior to handling. Do NOT spray the inside of the votives if you are planning on using real candles, as Krylon® paint is flammable when exposed to certain temperatures. Please follow the instructions on the can or click here Spray Paint Safety Tips for more information.